Expansion of a copper plant that has, for decades, been accused of polluting the state’s air, water and soil seems like a cruel joke. Why are the people of Tamil Nadu always protesting? Do they have no work? Do they not want their state to have industries? These questions come up every now and then considering the southern state has been in a constant state of protest, be it over Jallikattu, Neduvasal, NEET or other issues. The latest protest against the expansion of Sterlite’s copper plant in Thoothukudi adds to the list of growing agitations. What is so bad about a company that provides revenue to the state and jobs to people? Sterlite, a Vedanta group firm, is a major copper smelter. It is common knowledge that sulphur dioxide is a byproduct of smelting. The effluent is considered toxic by western countries for a number of reasons. Inhaling it can cause death, it has a corrosive effect on the skin and eyes and can permanently damage the respiratory system. It is also said to cause damage to the genetic structure, leading to mutation. Owing to sulphur dioxide’s fatal qualities, heavy regulations are imposed on how industries must handle and dispose the gas. Yet, this is where developing nations like India become a ready target of such industries. On March 23, 2013, the residents of Thoothukudi did not wake up to a regular sunrise after a good night’s sleep. They were woken up by their smarting, itchy eyes and a burning throat, unable to breathe properly. It was believed to be due to ongoing maintenance activities at Sterlite Industries, a part of Vedanta group. Some repair works were in progress at the site, when the Tamil Nadu Pollution Control Board (TNPCB) came in. They tested and accused the factory of releasing sulphur dioxide well above the prescribed limits and ordered the facility to be shut down. The company contested the accusation, saying they got a clean chit from the district environmental engineer and that they were being falsely accused. This was not the first time — it had previously happened in 1996-97, 1999 and 2001. The factory was originally planned for Maharashtra. It was forced out of the state by protests over pollution and emission fears. It was then that Tamil Nadu hit the jackpot. In 1996, when the factory opened, Chennai-based National Trust for Clean Environment, in a petition to the Madras High Court, had challenged all the clearances given to Sterlite. But at the time, the judiciary had raised no objections. The one big question that remains is: why was the factory allowed to operate elsewhere in India when it is deemed lethal and dangerous for Maharashtra? Are the bodies of the people of Tamil Nadu more resilient — do they have higher resistance to pollution? Or is the state machinery more gullible? Is it easier to “get” approvals here? The factory has been shut down multiple times only to be cleared again. Depending upon who is in power, protests erupt every now and then. With the numerous flip-flops by not just government bodies but also courts, it is the people who are left to contend with life-threatening emission and leaks on a day-to-day basis. In 2013, while the Supreme Court agreed with the petitioners, it allowed Sterlite to function after paying a fine of Rs 100 crore as a deterrent, citing the jobs of the employees, the country’s need for copper and the economy. If it reminds you of the adage “Sacrifice a village to save a state, sacrifice a state to save a country”, your inference is not wrong. That seemed to be the logic behind the verdict. Work on expansion plans while the existing factory itself has, for decades, been accused of polluting the state’s air, water and soil seems like a cruel joke on the people of Thoothukudi and the rest of Tamil Nadu. Their renewed protest is not just for their livelihoods but for their very existence. Fisherfolk and students too have joined in. 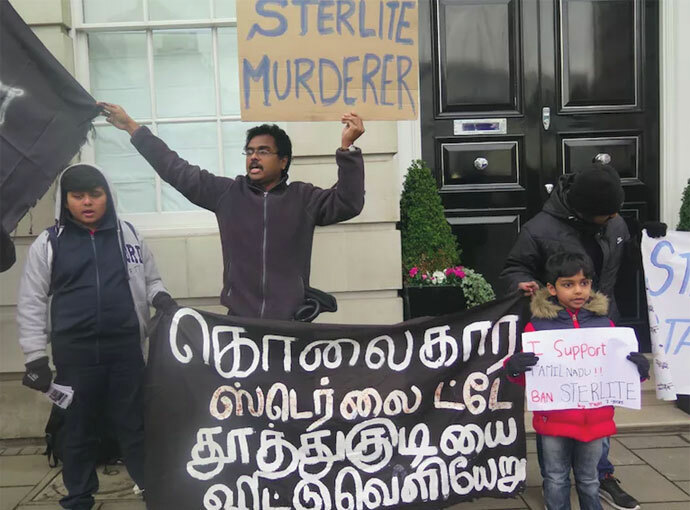 In London, outside Vedanta Group founder Anil Agarwal’s house, British Tamils have made their voices heard, too. Unfortunately for the protestors, everyone seems to hear their voice and feel their anguish except for those in power — the rich and the mighty. Neither the government nor the courts of the country seem to provide any permanent relief. The protests are only set to to grow stronger. Tamil Nadu’s people will not give up easily, for this is about their right to a healthy life. Writer is a man of letters who is passionate about his politics, environment and films.